PRODUCT: #10-16 X 1-3/4 Wood-to-steel Self-drilling Screw, Flat Head, With Wings, Clear Zinc Plating, Collated, with Driver Bit. 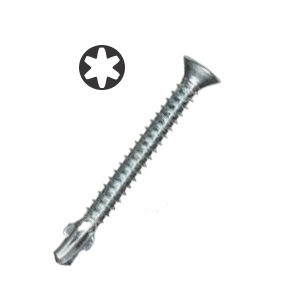 For Wood To 10-14 Gauge Steel Screws. 1000/box. Price/Box. (specify Drive BIt type before adding to cart). For attaching plywood or OSB to heavy 10-14 gauge steel steel. No predrilling. Hardened point provides penetration of steel substrates. Wings ream hole in wood, then detach when they reach steel.